In national rankings, Pennsylvania is consistently listed as one of the top states for deer vs. car collisions. Residents here have a 70-1 chance of being involved in one. Those collisions hit their peak in the fall—October and November in particular—during the deer mating season. The mating season, also known as the rut, coincides with deer hunting season in Pennsylvania, which the Game Commission says also scatters the animals. There were 24,136 deer-related crashes in Pennsylvania between 2010 and 2014. Of those, there were 16,790 hit-deer crashes reported in Pennsylvania from 2010 through 2014. Nearly half of those crashes occurred in October and November. The problem is so pervasive, that some communities have taken steps to thin out the deer population. In Mt. 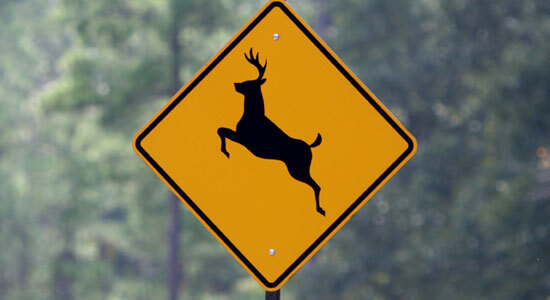 Lebanon, the number of deer-related car accidents spurred commissioners there to approve several controversial deer culls as part of the municipality's comprehensive deer-management program. The latest cull will begin this Saturday (Sept. 17) and run through Jan. 28, with a break between Nov. 27 and Christmas. The commissioners' goals? To reduce those types of car accidents by 50 percent over a five-year period. The decision to allow the culls came after civic leaders there noticed a spike in the number of deer-related police calls. The number of deer-related car incidents increased from 43 in 2013 to 73 in 2015—a 66 percent increase. The number of police calls from residents requesting the removal of injured or dead deer from roadways and driveways more than doubled over the last few years. There were 48 such calls in 2008. That number jumped to 127 in 2015. The severity of deer-related car accidents can differ, and sometimes, they can be deadly. Just this month, a 6-year-old boy in Lower Burrell was fatally injured in a car accident when his mother attempted to swerve to hit a deer. Instead, their car flipped and crashed into a tree. Be careful—especially when you're in an area where deer are often seen. Understand that deer are most active at dawn and dusk. Use your high beams at night in areas where there is no oncoming traffic. Don't rely on deer whistles or other devices that claim to scare away deer. As always: Wear your seat belt. If you're in a collision, it could save your life.